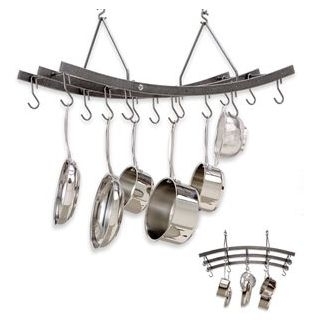 Not all pot racks are the same and this one is quite different - it is Enclume's only reversible ceiling rack. One view, with the rack ends sloping upward, displays a slightly modern Eastern flair. Flip it over with a little effort and it's a whole new design! Provides many angles for cookware and utensils. Removable hangers provide easy installation.